It’s been about 12 days since my Kickstarter started and it seems to be going well with 56% funding. However, it wasn’t the fairy tale I had dreamed of – the majority of donors are my friends and family, about 90% at this point. There hasn’t been a massive onslaught of people tripping over each other to donate to my campaign. Kicktraq, an estimator of campaigns, seems to think I’ll go over my goal, but I don’t really believe this as I’m a cynic and there are too many unknown variables. It’s still a great page to visit as it has all my updates to my project in one place. Sort of like an organized stalker. You can see the neat chart it compiled for my project here. I was also surprised by the amount of work required to keep this Kickstarter going. Foolishly, I had signed up for National Novel Writing month and instead of writing the next book, I find myself fretting over potential Kickstarter failure. 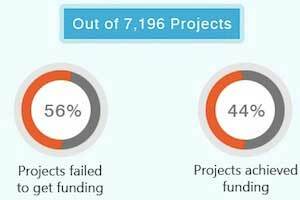 Out of a survey of 7,196 Kickstarter projects, 56% fail. Keeping the message of this campaign alive is important because your friends and family have other things on their mind and supporting your campaign is the least of their worries. So you try to keep your message alive by doing a number of things in order for new people (aka strangers) to discover your project. And also try not to be damn annoying at the same time or you’ll appear desperate! So successfully selling is really not selling…which is an art in itself! These are the things I’ve done so far with a links which can help others. To be honest, I’ve lost track of more places where I posted as I have been very tired lately. There were a few long shot things I also filled in online forms for such as CNN, Ellen show, Global TV and Oprah. Heck, a girl can try, right?! 1. Write a PR release – the lesson I learned here is that sometimes they don’t go anywhere. I wrote to many reporters (looked up contact info at different newspapers sites ranging from Toronto Star to New York Times to Asian ones) as well with this PR release, but alas, there are many other stories more compelling than your kickstarter or your book. But at least I can say I did this and learned how to write one. My PR release can be found here. 2. Do lots of social media – tweet by the hour. A friend said this was spamming, but he has never used twitter. Have you seen how fast the feeds go? I follow over 1000 accounts and having 1 tiny message will rarely be seen unless your followers are truly looking for your feeds. Facebook is another place I post lots of messages. How do you do all this, you ask? It’s not a secret, there is software available which you can load all your messages and schedule its release because you might be in a meeting when the message is released. Hootsuite software has been a lifesaver for me. 3. Post on pages and forums – there are lots of crowd sourcing sites and forums online which you can post your project to let people know of what you are doing. Keep in mind you are one out of a thousand projects running. I also posted on fantasy book forums which allows for kickstarter posts/advertising, otherwise they will delete your message. With some reluctance I put something on reddit but I was scared because it’s a double edged sword. People that hate someone on this site really go on an all out rampage of destruction and that scares me. 4. Plan a party – since mostly friends and family are my supporters, heck, let’s just party and enjoy ourselves! Any excuse to get together is great in my books! 5. Look for internet radio blog opportunities – I found out you can pay to be on an online radio blog. Timing is difficult as a Kickstarter doesn’t run that long. But I will try to get onto at least one so at least I can have a cool recording for permanent use. It is difficult to find stats on some of these internet radio sites which makes me wonder if anyone is listening. For $25 USD, I thought it was worth a try. 6. Read about successful campaigns – people who have made lots and lots of money on Kickstarter are very lucky. The people that did well did lots of work communicating with the world via all the things I’ve already mentioned and were lucky enough to get attention. It boils down to either having generous friends, online supporters or good timing with the media. So is all this work going to pay off? I’m not sure. My mommy says she’ll help out in the end, which is embarrassing but I might let her help me if I make it to 90% and support comes to a halt! Stay tuned! Thanks for mentioning us in the press release section. I’m sorry that you didn’t see success with regards to journalist outreach. We’re working on expanding our relationship with bloggers to make it easier for creators to get an “in” with online publications. I really like tip number 6. I also think it’s important to read about people who didn’t make headlines, but raised respectable sums (10k-50k). Sometimes, the campaigns that raised a tremendous amount benefited from great media exposure and good product-market fit, whereas the smaller ones really had to hustle to get every cent, which is more realistic for most products/projects. Previous Previous post: Deciding if you want to publish ebook or print?